Delegates and Their Families are Invited to Participate in Programmed Events. Click on links below to see and/or print out a pdf file of the full-size Program Calendar(s). 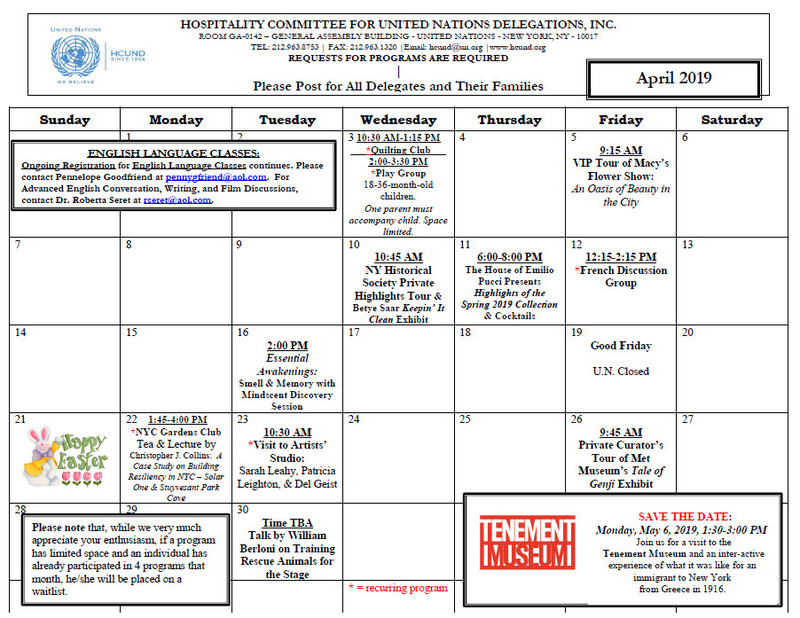 We invite delegates and their families to participate in a wide range of Program Calendar events. Please contact us at (212) 963-8752 for reservations and inquiries. REGISTRATION FOR ALL PROGRAMS IS REQUIRED IN ORDER TO ATTEND. PLEASE TELEPHONE OR VISIT OUR OFFICE TO SIGN UP. THANK YOU! Play Group 18-36-month-old children. One parent must accompany child. Space limited.